Vouchers accepted on smartphones or in print! Spring time travel in the Netherlands is incomplete with a visit to the spectacular Keukenhof Gardens, the world’s largest flower garden. The long stretch of bulb fields consisting of colourful tulips, daffodils and hyacinths are in full bloom for a period of 2 months each year. 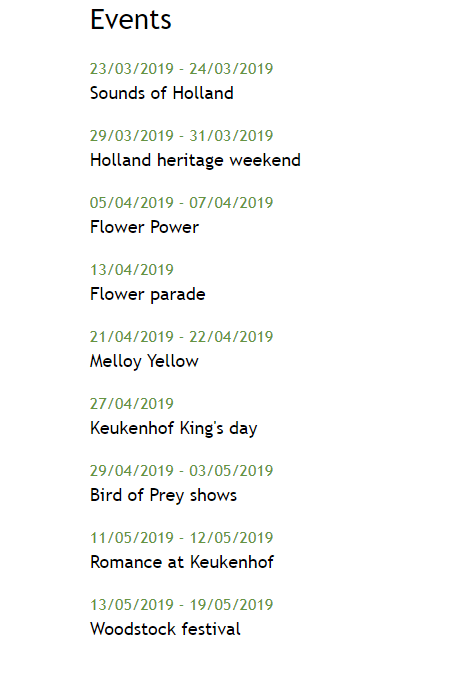 Pre-book your Keukenhof Gardens ticket and skip the long entrance queues and save up your time to experience the sheer abundance of colour spreading across 32 hectares of land. Keukenhof Gardens is open between 8am and 7:30pm. Keukenhof Gardens, Stationsweg 166A, 2161 AM Lisse, Netherlands. It is easily accessible by both car and by train and bus. You will receive bar-coded e-ticket in a separate email. Kindly use those vouchers to gain access to the Keukenhof Gardens. Free Wi-Fi is available around the pavilions at the park.A free map is available from the ticket office, information desk or entrance.To store your luggage there are free lockers available near the park’s main entrance.Dogs are permitted at Keukenhof, providing that they are kept on a leash. Dogs are not permitted to enter the pavilions and restaurants, except for guide dogs. Dog waste bags are available free of charge from our ticket inspectors. A beautiful day at the Gardens! The Gardens meet and succeeded my expectations, they where truly magnificent. ls a labor of love by an amazing group of people.